Find out what a tour of the Central Oregon Coast on horseback feels like from Turell Group&apos;s Kelli Warner. 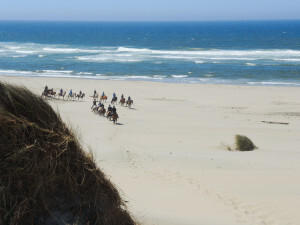 For more coastal adventures and trip ideas, head to our Oregon Coast page. As a child, I begged for a pony. I never got one, unfortunately. In fact, I can count on one hand how many times I’ve actually ridden a horse. As novice as that may sound, my husband and 17-year-old son have never ridden and my 13-year-old daughter’s only experience was a 30-minute ride at summer camp last year. That might explain why we’d driven past C&M Stables on Highway 101 numerous times on our family excursions to the Florence area, but we never stopped. All I can say now is—why in the world did we wait so long? I’ll be honest, there was a subtle, unspoken nervousness circling us as we stepped inside the office to check in for our ride—as if our inexperience would set off some alarm and somehow disqualify us. My nerves eased as soon as we met the warm, welcoming staff. It turns out we’re not the anomaly we imagined ourselves to be. 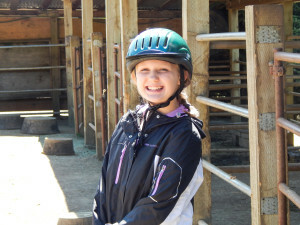 In fact, about 85 percent of the people who come to C&M Stables are beginners—just like us. After reading the instructions and guidelines and filling out the appropriate paperwork, we donned our helmets and headed out to the corral. We were about to be introduced to our guide, Tyler, and the horses that would turn our family’s picture-perfect afternoon on the coast into an unforgettable adventure: Cowboy, C.J., Styles and Sandman. Standing there, ready to saddle up, I felt like a kid again—a kid who was finally getting that pony. I could not have been more excited. 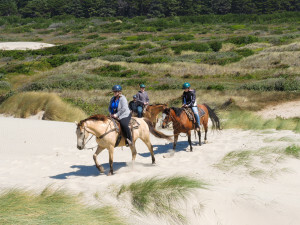 Tyler explained the fundamentals of how to hold the reins, how to get the horses to go, to turn right or left, and to stop (most important in my book) and within minutes, we set out on an easy ride over nearby nature trails, then headed for the dunes and the beach. We’re native Oregonians, and we’ve visited the coast many times. 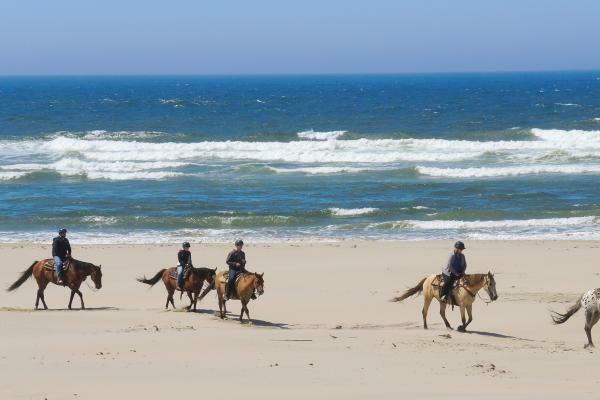 It’s one of our favorite places, but seeing the dunes and the beach on horseback was like seeing it for the first time. Looking up at the massive dunes, it was hard to imagine climbing them, until the horses were actually doing it. I was in total awe of their strength and power navigating through sand. As we descended the dunes, we met another group of riders on their way back to the ranch. They told us how much fun they’d had on the beach, and we quickly realized why. Except for the seagulls and the crashing waves, we had the area all to ourselves. It was incredibly peaceful. 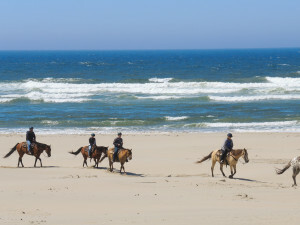 We were allowed to break from single-file trail formation and ride independently and spread out, even riding along the surf (like they do in the movies!). We were also given the opportunity to trot our horses if we chose. Tyler offered to take pictures of the family with our camera, and I appreciated that—these memories were keepers. The mild nervousness we felt at the beginning of the ride turned into a twinge of disappointment when it came to an end. After we climbed down from our horses, the silence was broken as we talked over one another, sharing our favorite parts of the ride—a conversation that lasted well into the car and our lunch in Old Town Florence. My son told me he was glad we went, and my daughter was proud of the confidence she’d gained. 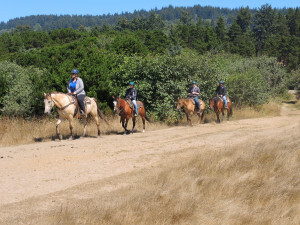 For more horseback trails from the Coast to the Cascades, check out our trails page here.